I know. I’m one national holiday too late. But still, I had a dream. And no, it wasn’t the one where I was flying over buildings or showing up late to school without my pants. Or flying pant-less over buildings to make it to school on time. That would be absurd. This was a real life dream and something that could impact more than just me and my personal well-being. This was something that had the potential to change people’s approach to food. To health. To life. This was a dream about making bagels, pizza, and bacon wrapped scallops, without the salt. And then encouraging other people to do it too. 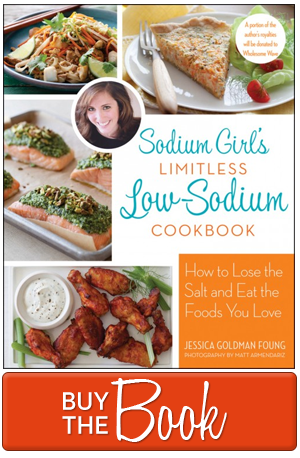 Then I woke up, and two weeks ago, I sent out a challenge, a few tweets, and a handful of emails, asking a group of bloggers to do just that – cook a single recipe with little to no sodium. I asked them to do this because, during this month of February, we are currently celebrating Heart Health month, Valentine’s Day, and the release of the USDA’s new food regulations (which now say that 50% of Americans need to eat 1,500mg of sodium or less a day – about 1/2 a teaspoon of salt). With all of that going on, I thought we needed to have a cyber party. With lots of food and maybe some festive hats. And fifteen people responded – enthusiastically – even though none of them have dietary restrictions. And trust me, none of them took the challenge lightly. To stick to the low so guidelines, they could have simply baked chicken without any salt or blended tomatoes together and called it soup. But instead, because they are all culinary rockstars, they picked recipes that were highly dependent on soy sauce, cheeses, broths, and breads. All ingredients that are high in sodium. They asked questions; they shared their discoveries (really? there’s sodium in milk! ); they began to notice how high sodium is in both packaged and natural ingredients; they found great solutions by thinking beyond the Morton’s box; they withstood ridicule from their wives (sorry Oui, Chef! ); they made multiple attempts until things tasted just right; and I think it is fair to say that they even surprised themselves with the salt-free results. I know I’m beyond impressed. In the end, they created sixteen incredible low sodium dishes for you, me, and America to enjoy. But beyond the gusto and total generosity they gave to this project, they also proved that, as food-loving, salt-enjoying eaters, low sodium, making satisfying versions of their favorite foods was not only possible, but exciting. And while I could talk about these bloggers until the end of the day, I think it is time that you leave this page and check out their masterful work. So, without much further ado, let me present to you the first ever Love Your Heart Recipe Rally. There is plenty of good reading and eating to last you through the long weekend. Thank you again to our unbelievable low sodium superheroes who went beyond the call of duty (and who, I hope, are all wearing pants). I know that these recipes – and each cook’s own journey – will inspire you and your loved ones to cook food that will feed and fuel your body. And I also hope they inspire you to experiment and innovate on your own as well. Even with a low sodium diet, there’s nothing you cannot make. It may taste a little different, it may look a little different, but the creativity you will bring to the table will surely please the eye, stomach, kidney, and heart. And as for my contribution (this is my party and I can cook if I want to), check out the recipe for “Fake’in Wrapped Scall-Nots” below. Click, read, and chow on. 1. Mix the curry and brown sugar together in a wide bowl. In a separate bowl, do the same with the cumin and smoked paprika. 2. Bring a small pot of water to boil and quickly blanche the zucchini ribbons, 1-2 minutes. Immediately remove from pot and dunk them into the cold water bath, 3-4 minutes. Remove from water and tap to shake off extra liquid. Roll the zucchini ribbons in the cumin/paprika bowl until well covered. Set aside. 3. Using a tablespoon scoop, press down lightly on the halibut filet (start in the corner, like cutting cookies from dough). 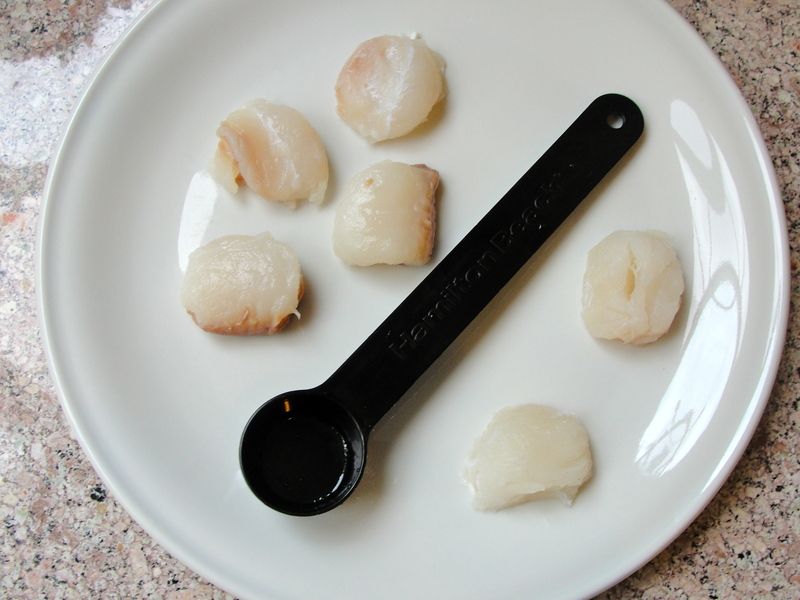 Trace the shape with a knife to cut out scallop-like rounds. 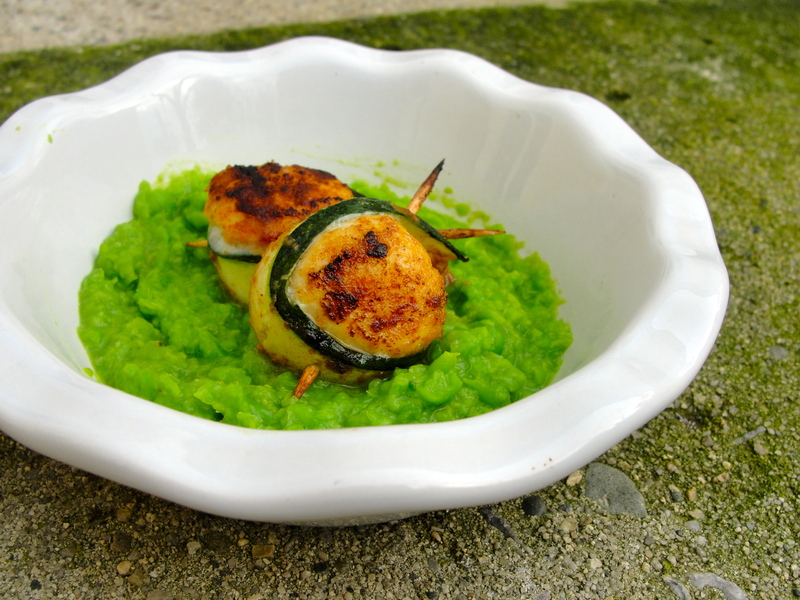 Repeat until you’ve created 3 scallops per guest. 4. Dredge the halibut rounds in the curry/brown sugar mixture. Make sure both sides are covered. 5. 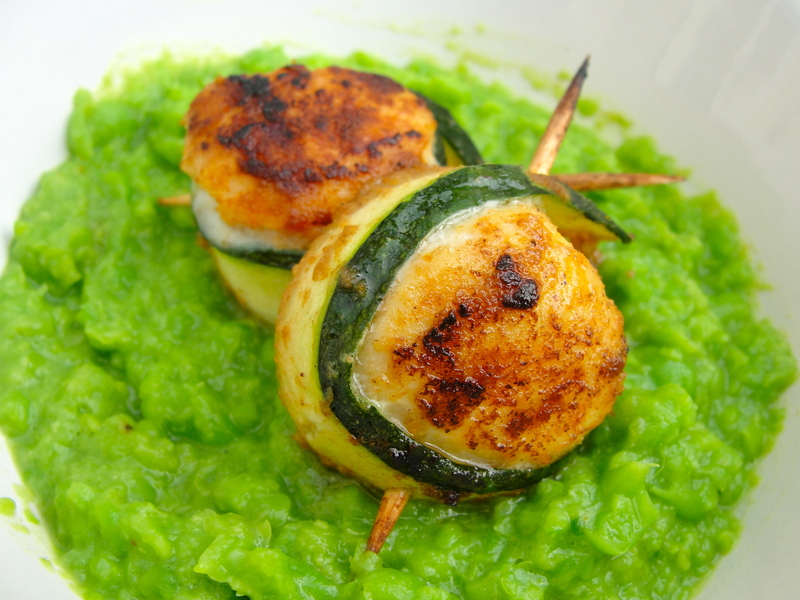 Slice the zucchini lengthwise into three equal ribbons – the width should be about the height of the halibut scallop. Repeat until you have enough ribbons for each piece of fish. 6. Wrap the zucchini ribbon around the halibut and secure with a toothpick. Repeat until all the halibut scallops are wrapped. 7. Heat olive oil in a large pan over medium-high flame. Add the halibut rounds to the pan in a single layer and cook, 5-8 minutes per side or until halibut has a golden sear. Remove halibut and set aside. 8. 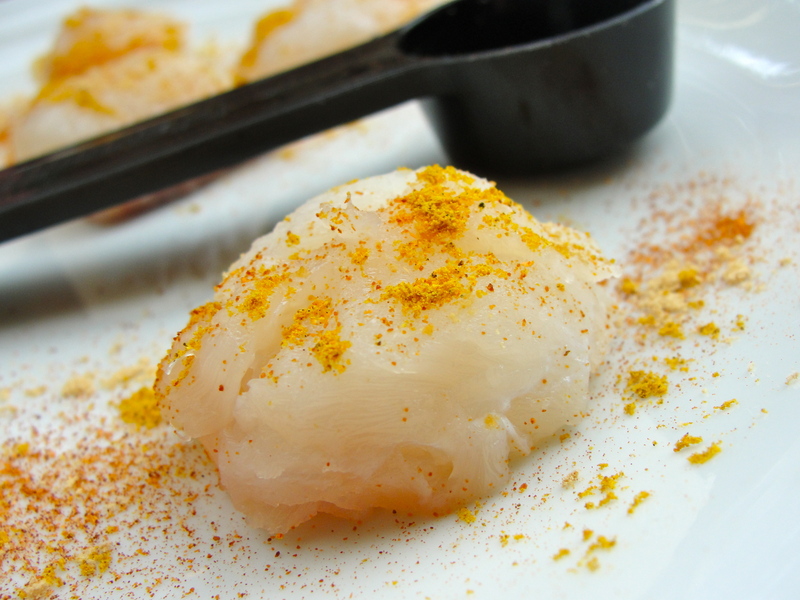 Just before serving, place all the halibut scallops on a cookie sheet and cook in your oven’s broiler (on low) for 3- 5 minutes. 9. 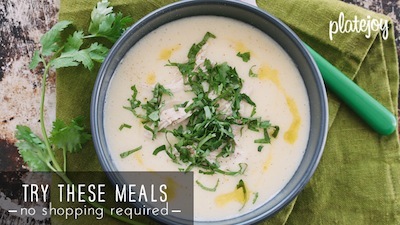 Remove from oven and immediately serve over something luscious, like white wine cream sauce, or something super healthy, like a vibrant pea puree. Enjoy. What a great concept! Thanks for posting! wow! those looks pretty darn good. what do you think about adding a bit of citrus??? I think it is a brilliant idea! A little lime or orange will go a long way! Thanks for including us! A fun challenge indeed! Thank you for participating! Can’t wait to make the recipe. All the recipes look so delicious!! Thank you for putting this together 🙂 I’m already looking for new dishes to make low-so versions of. Yay for heart healthy bloggers! So much fun, Jess. Can’t wait to pour through the rest of these recipes over the weekend. As a certified SG taste-tester…I can tell all of you that Jess’ recipe above is AWESOME!! Any of the rest of you need an official taste-tester…I’m totally available. Thanks for sharing with all of us! Thanks SG for being a great party hostess! I also dreamed how to cook a sumptuous meal like this one. It really looks delicious. Another great post, good going!Thanks for information.